The Consumer Price Index (CPI) rose 0.5% in March, following a similar increase in February. The 3.5% increase of the energy price index and the 0.8% jump in food prices made up three quarters of the overall increase of the CPI in March. On a year-to-year basis, the CPI has risen 2.7% in March, putting the three-month annualized gain at 6.1%. The core CPI, which excludes food and energy rose 0.1% in March, which yields a three-month annualized increase of 2.0%. 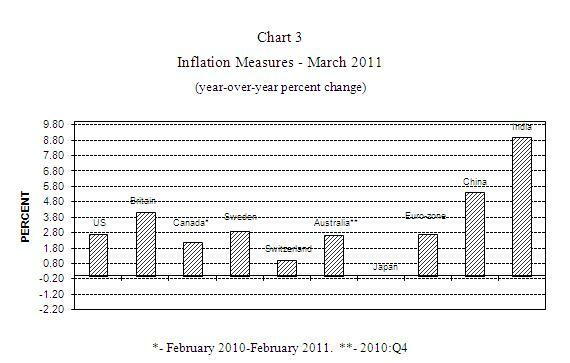 The acceleration of these inflation measures in a short time period is noteworthy (see Chart 1). Inflation measures are moving up consistent with the objective of the quantitative easing program in place. The goal was to nudge prices upward gradually in line with growth of the economy. But, food and energy prices have shot up sharply in a short span of time while the pace of economic growth and employment gains remain significantly short of the Fed's full employment mandate. Immediate tightening of monetary policy to curtail inflation would setback economic activity. In 2008, when oil prices rose sharply, the Fed was able to select economic growth in inflation-growth debate because a severe financial crisis was underway and the prospect of significantly weak economic conditions was becoming clear. At the present time, the FOMC doves still have the upper hand and can cite a litany of evidence to make their case. 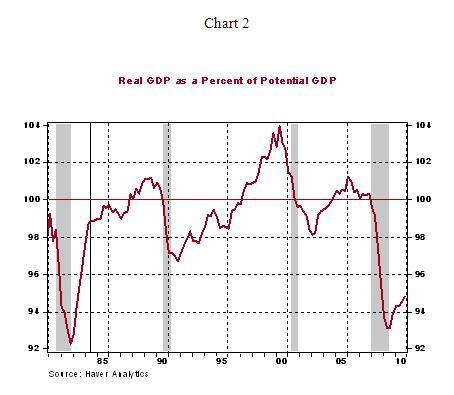 Although, the unemployment rate has declined to 8.8%, it is holding at an elevated level and real GDP is noticeably below the potential level (see Chart 2). 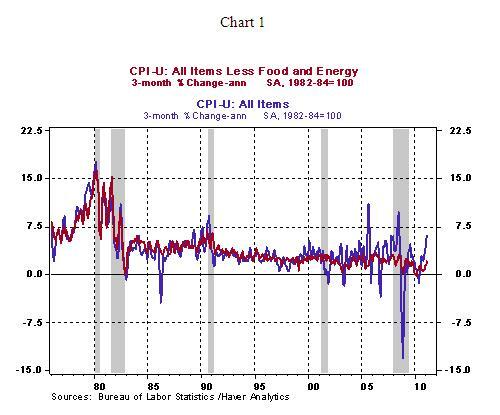 Under these circumstances, the Fed can continue to view food and energy prices as "transitory." But, the call will get more challenging if food and energy prices continue to climb and worrisome spillover signs emerge. Inflation has once again emerged at the top of the worry list of central bankers. The latest inflation reading (+2.7%) in the Euro area exceeds the policy target of 2.0%. Latest inflation numbers from China (+5.4%) and India (+8.9%, wholesale prices) have raised expectations of another round of tightening of monetary policy conditions in the near term. From the details of the US CPI report, the energy price index has moved up 23.1% since June 2010. Among the components of the energy price index, gasoline (+5.6%), heating oil (+6.7%), and electricity (+0.7%) posted gains and natural gas prices declined 1.4%. 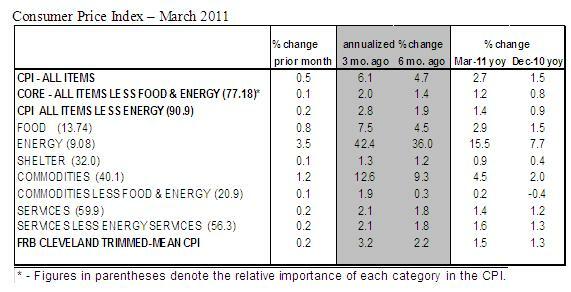 In addition to higher energy and food prices, prices of several other items also moved up during March. Shelter costs (+0.1%), prices of new cars (+0.7%), used cars (+0.8%), airfares (+0.4%), and medical care (+0.2%) rose in March, while apparel prices fell 0.5% and recreation costs held steady.